On Monday, the great and the good of the UK radio industry, and visitors from beyond, will gather in Salford for the annual Radio Festival. If you’re going, say hi to me! But there are potentially some dark clouds on the horizon. It might be a somewhat distant horizon, but the radio industry – as we currently know it – could well face a significant threat from digital usurpers. Anyone who’s heard The Sound Agency’s Julian Treasure speak recently will know that he believes it’s a threat that competitive digital arrivistes are even adopting the word “radio” to represent their streaming products. These are not offering what we have previously understood the word radio to mean, and could we be losing ownership of the word? For example, a recent report from an American group – NPD – says that “radio” services from companies like Pandora which use algorithms to determine which tracks are served up, are overtaking those of companies like Spotify which are based more on the curation of tracks. OK, that quote bundles everything together, and the report specifically points out that traditional “radio” is still the most popular listening choice, but clearly there are more of these services coming. And they’re only going to get smarter and more elaborate. Now it should be said that since I’ve only been able to read a press release and not the full report in this instance, there are some things I’d like to know about the report’s methodology. For example, is it just talking about the number of users that each service has, or does it reflect the amount time users actually listen to each of these services. That’s important because listening hours – or share – is the critical measure for anyone working in commercial radio. And how is that listening measured? Are respondents just asked to estimate how much listening they do to each service, or do they need to actually keep a diary to measure it? (I don’t believe PPM or other technology was employed by NPD). And concatenating “internet radio” and “streaming services” is perhaps a little unhelpful. Microsoft has a free ad-supported Xbox Music service that launched alongside Windows 8, and perhaps more worryingly Apple has it’s own streaming product widely expected to be launched sometime early next year. That too is believed to have an ad-supported model embedded into it. There are still plenty of challenges in an IP-only world of course. While your home or work broadband might be up to the task, that’s almost certainly not the case when you leave your home. And it’s almost certainly not if you rely on 3G. 4G/LTE may be around the corner, but data caps probably limit the amount of streaming media anyone’s likely to be doing anytime soon. That won’t be the case forever of course. Anyway, significant proportions of audio streaming on devices like mobile phones come when they’re connected to WiFi. So if a service is available on a mobile and it’s any good, it’ll get used regardless. Certainly the percentage of the population who own smartphones is only going in one direction. “Traditional” radio of course has plenty going for it. You probably already have multiple radios, and it reaches places other media don’t. The car, for example. Then there’s the small matter of the bits in between the music, which I think just about everyone is now realising are becoming more important than ever. I can hear that new Adele song in 101 other places, but a presenter saying something witty or putting it into some kind of context is something that only radio is able to deliver. Indeed Spotify has dabbled a little in the radio world and put together some “shows” with presenters. But suppose Spotify hired Chris Moyles. Then what? Leaving aside the fact the Moyles’ act is built largely on speech, it’s not unimaginable that Spotify could lever a series of pre-recorded show links into your preferred playlist. Your phone might be loaded up and raring to go when you take it off charge in the morning, with the links freshly recorded early that morning to keep them topical and relevant. Spotify’s mobile app is already pretty clever at making songs available offline. You’d lose the interactivity of a truly live radio of course, and in my example that’d probably be critical since a presenter like Moyles almost requires an audience listening live and interacting with him for his show to work. But others could adapt to make it work. Music radio did manage to exist texts and emails after all. As I say, Spotify has travelled a little down this route already, and dropping news bulletins into your playlist wouldn’t be hard for them to do. I strongly believe that radio’s way of fighting back is to quickly adopt a hybrid model. Of course there’s fairly broad consensus that this is something we need to do. I’m not exactly out there on my own here. A hybrid model of broadcast and internet would effectively entail a broadcast in either FM or perhaps more likely broadcast digital radio (e.g. DAB in the UK) alongside a WiFi, 3G or 4G/LTE connection. Anyone familiar with Radio DNS will have perhaps seen demonstrations of things like Radio Viz which allows side-loaded imagery to be served up alongside broadcast radio on devices with colour screens. Then there’s Radio Tag which would enable sets to have a single button which could capture interaction in a neat and clever mechanism. For example, just pressing a button when some music or an interesting advert comes on the radio would let the user “tag” it. Later they’d be able to go back and examine in more detail what it was they were interested in. At next week’s Radio Festival, Radioplayer will demonstrating a prototype hybrid radio that offers stations regardless of whether they’re FM or internet delivered. It features a colour touchscreen – as surely most of our devices will and in the future – and is built on the technology I’ve just been talking about. It’s a “concept car” if you like. It begins to show you what’s possible. But let’s go a step further forward. Absolute Radio (Disclaimer: my employer), has been pioneering InStream in UK, serving targeted advertising to logged-in listeners based on things like demographics and location. Add some of that thinking into a hybrid model that was able to deliver the best of broadcast’s strengths, with the personalisation that IP connectivity also allows. Then think about where you may end up. Imagine a journey in a car where you tune to your favourite radio station. You hear a presenter you know and trust – radio’s trump card. Utilising the broadcast platform, the station plays music that it has curated for you – saving you the effort. It’s a commercial station, so you hear advertising. But because you’re logged in, and while you were enjoying the broadcast music, relevant advertising has been side-loaded via IP into a buffer on the radio and it’s now served to you in place of broadcast advertising as it’s more relevant and interesting to you. Needless to say, this all happens seamlessly. The radio station is able to tell your car exactly how long the ad break is and therefore how many ads to serve. (Sky is due to launch something very similar to this called AdSmart in the summer of 2013 for television subscribers with Sky+ boxes). The traffic and travel news comes on, and because the radio can feed back your location, it’s highly personalised, dealing with the motorway you’re travelling along. Google Now is very adeptly doing this sort of thing on Nexus products today. In reality the radio in your vehicle is receiving data in the form of text which a superior text-to-voice HTML5 web audio engine within the radio is able to deliver in a superior Siri-style voice. The weather is similarly personalised to your location. And when the news bulletin comes on, you get a version of that based on national news of importance to all, and localised news based on where you are. Pre-recorded segements from reporters could be dropped in as the pre-recorded ads are. And while I’ve considered a commercial case, much of this would also be of relevance in the public sector. Indeed the BBC R&D department has already done something like this using geolocation technology and the web audio API in an experimental drama called Breaking Out. I recently saw Tony Churnside demo it at a Radiophonics Day in London, and it’s quite impressive what you can already do it a browser like Chrome. Give it a go! Now imagine that the voice native in that API was significantly improved. This seems highly likely in the future. And since there are limited number of sounds the human voice can make (in English anyway), you could potentially deliver those automated bulletins using your station voices! While you would need to tread a fine line between clever targeting and Minority Report style over-personalisation (How about an advert that actually used your name in it? Too much? ), this could continue to leave radio in a very powerful position in the media landscape. “Targeting” and “big data” are the buzzwords du jour and radio has to keep up. 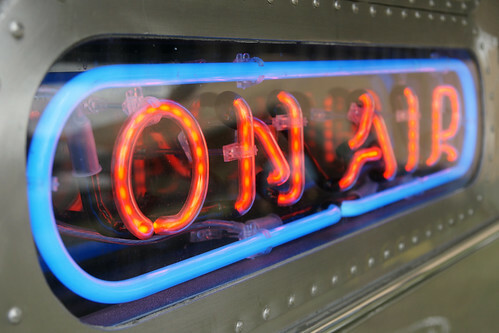 In commercial radio, we need to continue to provide advertisers with what they want. Agreeing some standards is probably what we’re looking for now to enable this future. And as I say to dissenters, if radio doesn’t do it, then the likes of Spotify, Apple, Pandora, Google, Microsoft and any number of other groups are likely to do it anyway. It would seem a shame to miss that particular train. I for one don’t want to. * Of course it doesn’t take a genius to realise that the effects of global warming are already being felt. I’m certainly not a denier – the ice caps continue to melt, and we get freak weather systems. This was more a turn of phrase.